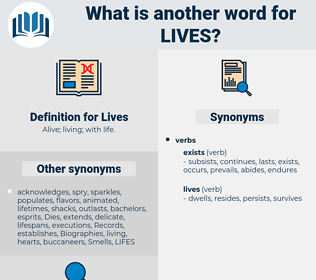 What is another word for Lives? communications, circumstances, fields, instructions, conditions, operations, years, environment, Families, lies, relationships, half-lives, characteristics, Realities, welfare, health, surroundings, responsibilities, deaths, affairs, furnishings, completely, careers, relations, Killings, die, Dies, peoples, afghanistan, Difficulties, briefings, Soldiers, interventions, demonstrators, representatives, things, Animals, sacrifices, importance, useful, improvements, stockpiles, Households, terms, matters, Casualties, personnes, Friends, purposes, effects, interests, kills, kill, times, materials, Destinies, Disabilities, technologies, presentations, quarters, issues, Biographies, hello, maintains, periods, dying, behaviours, Females, levels, conflicts, Occupations, Children, Died, workings, factors, personnel, victimes, Societies, losses, minds, steps, Murders, requirements, protesters, development, developments, Suicides, fortunes, cattle, souls, civilians, pursuits, inhabitants, Relatives, skills, government, iives, courses, channels, exists, challenges, humans, orders, Necessities, individuals, outcomes, inmates, routines, Appointments, Incomes, follows, Inventories, Refugees, fates, passengers, situations, practices, beings, pelts, Survivors, processes, links, fall, places, hide, hides, submissions, Respondents, residents, discussions, Hearings, eyes, participants, settlements, media, decisions, spirits, candidates, birth, Births, elders, customs, acquisition, exits, Canadians, ways, girls, flats, Injuries, wits, Whites, disputes, others, Rights, substances, presence, stocks, subjects, expenses, functions, priorities, Attitudes, Persons, homes, Roles, NATIONALS, PATHWAYS, arrangements, change, changes, Adults, suspects, trails, Opportunities, districts, targets, Her, dangers, views, figures, kids, status, Activities, Standards, jours, seniors, LINEs, words, regions, troops, officers, Sports, partners, ties, MINERS, moments, Males, hours, actions, managers, Habits, programmes, victims, Students, warheads, witnesses, Areas, debates, Faces, guts, ec, aspects, tenants, employees, hands, locations, holdings, Stories, needs, exports, Prices, hazards, roads, Wines, ravages, necks, patterns, always, Feet, means, costs, streets, guests, choices, Countries, problems, methods, workers, Agencies, Paths, women, Bees, sites, routes, Bodies, Quarries, heads, events, acts, grounds, Forms, mode, HOS, reasons, Ones, kinds, zoos, lots, Programs, news, 80S, \, fast, guys, avenues, weeks, Asses, approaches, Risks, types, D, never, ", cases, groups, members, concerns, 2008, 2002, Him, act, alive. survives, thrives, evolves, subsistence, Leaves, deprives, prevails, inhabits, Gives, dwells, moves, evaluates, population, subsists, circumstances, resident, files, highlights, persists, feels, remains, lies, suffers, Flourishes, establishes, feeds, depends, perpetuates, VES, responds, represents, accommodates, operates, includes, Has, increase, leads, consists, belongs, Addresses, contains, occupies, appraises, understands, nourishes, stays, weighs, enables, Dies, undertakes, prevents, continues, relates, arises, eats, is, Houses, kills, finds, absorbs, conducts, grows, maintains, assesses, Affects, occurs, stems, holds, Comes, happens, works, respect, respects, throws, brings, iives, exists, answers, stands, Rests, knows, robs, takes, places, citizens, passes, presence, Persons, meets, views, shows, puts, gets, witnesses, Faces, accounts, exports, 's, means, Bases, woman, Does, makes, reside, resides. lifetimes, living, circulation, VIDAS, Lifestyles, lifestyle, live, lifelong. 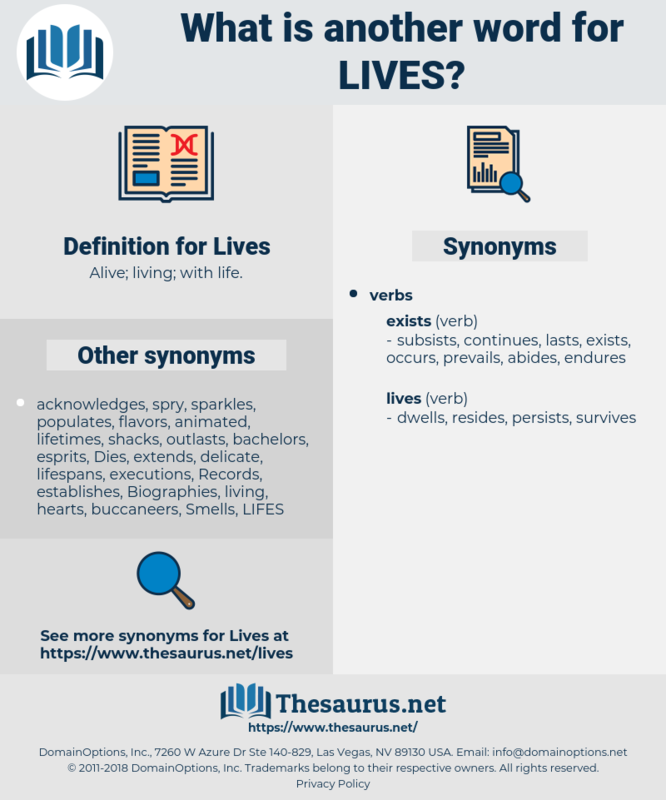 livelihoods, Fatalities, Populations, Communities, Histories, future, durations, Dreams, citizens, spheres, lengths, ends, safety, stages, Arenas, ages, men, lifetimes, living, reside, resides. No; not to save your lives, I wouldn't! The bird it lives with. levy, lop off, life, loaf, levi, lapp, leap, lay off, lviii, lev, loop, Li Po, lap up, lv, lb, lovoa, lavabo, layby, libby, lob, leipoa, lf, l-p, lp, loupe, lop, lollipop, leafy, lay up, lope, luffa, lab, love, lip, lullaby, leppy, lay-up, loofa, layup, lowlife, lay-by, loopy, llb, lobe, lvi, levee, lvii, lifo, Lowboy, lube, lollop, luba, leave, layoff, lippi, liv, leaf, lief, lobby, libya, lip off, leave off, lbf., luff, lav, loofah, livy, loeb, lap, lave, lava, life buoy.